An ethical horse breeder will never breed just for color. Before you pair two horses, ask yourself if you'd want a foal from those two if it came out a plain base color; for example, chestnut. Ask yourself if it would still sell at a decent price to a good home. Please don't breed horses that will add to the thousands, if not millions, that are unwanted and neglected. Thank you. ICHR expects advertisers to hold to a code of conduct and disclosure. 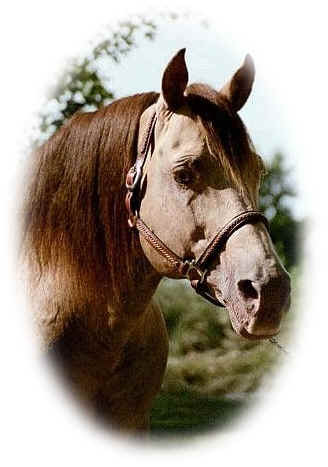 Breed-appropriate testing for genetic lethal or other genetic defect should be performed, and the results included in your stallion listing with ICHR - whether in printed or web form. These tests include but are not limited to: OLW (frame overo), HYPP, HERDA, GBED, JEB, SCID, or as appropriate for your breed of horse. Breeders should be familiar with the gene(s) and combinations that result in lethal or severe debilitation in their breeds. Take the time, and ask the hard questions, to be sure that you don't reproduce any of these defects in your precious foals. It is a true saying that "a good horse is never a bad color." But if you want a good horse that also has champagne color, we list here some guidelines to help you achieve that.